When my granddaughter Katherine's baby sister was born, she became obsessed with all things "baby". Quite natural, I guess! 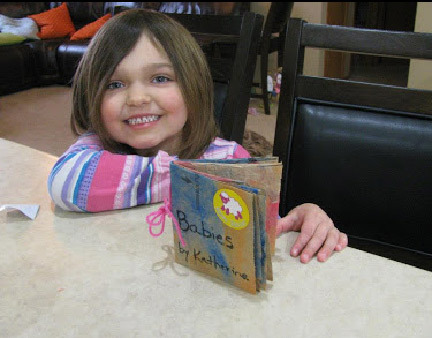 The first project we did together was to create a book out of an old brown grocery bag, and Katherine declared that it was going to be all about babies. We created one of the simplest book forms there is...you don't even need a pattern to get this one right! Start with a rectangular or square piece of grocery bag and paint it as you please. 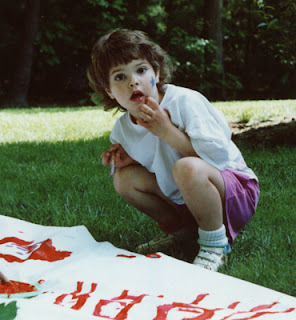 Katherine wanted to add lots of glitter paint, which took a bit longer to dry than if we'd just stuck with acrylics and crayons. No problem! We got the paper wet and colored all over it. When it had dried overnight, we ironed it (using some parchment paper to save the iron). The next step is to fold it up: we folded it in thirds lengthwise and in quarters across, folding it in half two times instead of like a fan. Keep the fold to the inside and use an awl or needle to poke three holes through the "spine". Using a doubled length of yarn that she had sitting around, we stitched into the middle hole from the outside, up through the top hole from the inside, into the bottom hole from the outside, and back out the middle hold from the inside. With the yarn on opposite sides of the cross thread, tie a knot or a bow. Using a sharp pair of scissors, cut apart all the pages (except along the spine, of course!). It will already have great color all over it, so now it's time to name and decorate the pages. 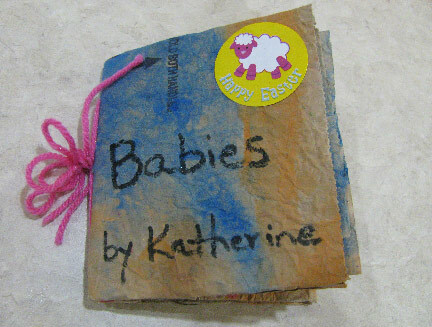 Baby animals figure prominently in Katherine's finished book! What a great photo and memory. What a cutie pie! Love this idea, too.